Sessions v Dimaya – How Will Justice Gorsuch Vote? Today the Supreme Court heard oral argument in Sessions v Dimaya. Most people have probably never heard of this little case, but in the world of criminal defense and immigration law Sessions v Dimaya has the potential to be a landmark decision. Sessions v Dimaya - It's All About The "Residual Clause"
Section 16(a) is known as the "elements" clause. That clause is not at issue in Dimaya. Section 16(b) is called the "residual clause." If a crime does not fit the definition under 16(a), courts look to whether the crime qualifies under section 16(b). Section 16 is so important because whenever a federal statute references the term "crime of violence," but does not provide its own definition for the term, Section 16 controls. And as it happens, there are a good number of federal statutes that rely upon section 16's generic definition of "crime of violence." Some are federal criminal statutes. Others relate to federal immigration law. In 2015 Justice Scalia penned Johnson v. United States, which invalidated the residual clause of the Armed Career Criminal Act (ACCA) as unconstitutionally vague. The ACCA's residual clause is worded very similar to section 16(b). Thus, the argument goes, section 16(b) must also be unconstitutional like the ACCA's "residual clause." But there is an important distinction between the ACCA's residual clause and section 16(b), at least in Dimaya. The challenge to section 16(b) in Dimaya arises in a civil context, the application of federal immigration law. The Supreme Court traditionally gives less scrutiny to claims of unconstitutional vagueness when the statute at issue is civil instead of criminal in nature. This is the primary argument the Government relies upon in arguing that section 16(b) is not unconstitutionally vague like the ACCA's residual clause. Dimaya has been hanging around the Supreme Court for a long time. The Court heard argument in the case in January 2017. The Court, however, was unable to resolve the case by the end of its 2016 term. The justices were split 4-4. 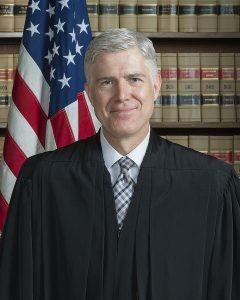 Justice Gorsuch did not cast a vote because he was not on the Court when the case was originally argued. So the Court decided to schedule the case for re-argument--a real rarity. That argument was held October 2, 2017. All eyes were on Justice Gorsuch. And he did not disappoint. The Government began its argument by trying to draw a distinction between the "fair notice" requirement for criminal statutes and "fair notice" for civil statutes, but Justice Gorsuch was quick to shut this argument down. JUSTICE GORSUCH: And isn't it really important in the civil context, too, when we have so many civil laws today, and they're often hidden away in places like the Federal Register and other -- other fine reads like that? Next the Government tried to argue that it was permissible for Congress to write 16(b) is such an expansive way. Again, Justice Gorsuch shut the Government down. JUSTICE GORSUCH: Really? Even when it's going to put people in prison and deprive them of liberty and result in deportation, we shouldn't expect Congress to be able to specify those who are captured by its laws? JUSTICE GORSUCH: the consequences in many civil matters can be very grave, more so even than a lot of criminal penalties. Civil forfeiture, take a man's home, his entire livelihood, deport him. And I can think of lots of other examples that can be graver than misdemeanor offense on the books today. JUSTICE GORSUCH: What do you think about this line? Life, liberty, or property ... It's right out of the text of the Due Process Clause itself. Given the tenor of the argument today, I will be surprised if Justice Gorsuch does not cast the deciding vote that strikes down 18 U.S.C. 16(b). And when that happens, well, the fun really begins.